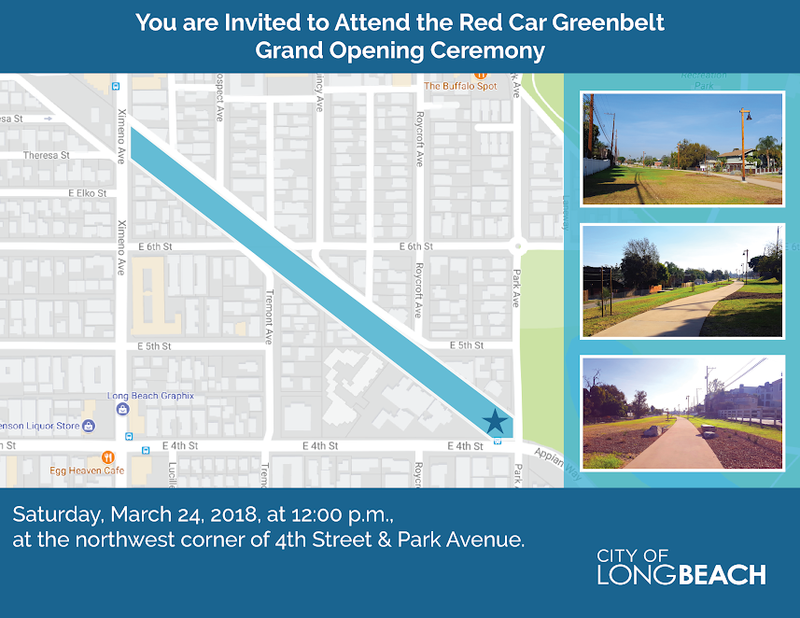 City officials are inviting the public to join them in celebrating the grand opening this Saturday of the Red Car Greenbelt—a 3.66-acre project named after an old Pacific Electric Red Car trolley route that features a pedestrian walking trail and native landscaping. The celebration will take place at noon this Saturday, March 24 at the northwest corner of 4th Street and Park Avenue. The project includes trailheads at the entrance of 4th Street at Park Avenue and at the entrance on Ximeno Avenue, south of 7th Street. The 6th Street Bike Boulevard crosses the trail at 6th Street and connects the Greenbelt to the city’s bike route network, officials said. It also features pathway lighting, trail boulders for seating, trash receptacles and doggie bag dispensers, wood grain textured concrete fencing at entries, and secondary decorative concrete pedestrian trails along the length of the greenbelt, connecting local streets adjacent to the greenbelt.